Sodium hypochlorite is a greenish-yellow liquid that forms a major constituent of many bleaching agents (especially laundry bleach). Sodium Hypochlorite Poisoning is the accidental or intentional intake (swallowing, breathing-in, or skin contact) of any product containing the compound. What is Sodium Hypochlorite Poisoning? What are the Causes of Sodium Hypochlorite Poisoning? What are the Signs and Symptoms of Sodium Hypochlorite Poisoning? The signs and symptoms of Sodium Hypochlorite Poisoning can vary from one individual to another. It may be mild in some and severe in others. Several systems of the body, such as the vascular system, digestive system, respiratory system, skin and ENT, may be affected. How is First Aid administered for Sodium Hypochlorite Poisoning? Who should administer First Aid for Sodium Hypochlorite Poisoning? 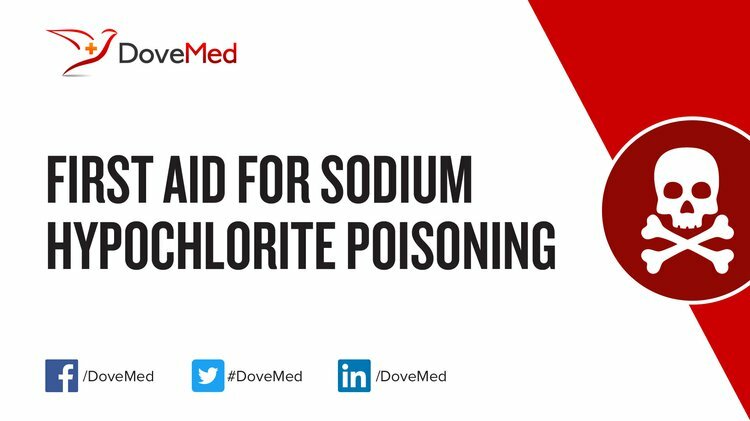 First aid for Sodium Hypochlorite Poisoning is administered by healthcare professionals. What is the Prognosis of Sodium Hypochlorite Poisoning? How can Sodium Hypochlorite Poisoning be Prevented? Stojicic, S., Zivkovic, S., Qian, W., Zhang, H., & Haapasalo, M. (2010). Tissue dissolution by sodium hypochlorite: effect of concentration, temperature, agitation, and surfactant. Journal of endodontics, 36(9), 1558-1562. Essner, M. D., Javed, A., & Eleazer, P. D. (2011). Effect of sodium hypochlorite on human pulp cells: an in vitro study. Oral Surgery, Oral Medicine, Oral Pathology, Oral Radiology, and Endodontology, 112(5), 662-666. Goswami, M., Chhabra, N., Kumar, G., Verma, M., & Chhabra, A. (2014). Sodium hypochlorite dental accidents. Paediatrics and international child health, 34(1), 66-69. Zou, L., Shen, Y., Li, W., & Haapasalo, M. (2010). Penetration of sodium hypochlorite into dentin. Journal of endodontics, 36(5), 793-796. Zhu, W. C., Gyamfi, J., Niu, L. N., Schoeffel, G. J., Liu, S. Y., Santarcangelo, F., ... & Tay, F. R. (2013). Anatomy of sodium hypochlorite accidents involving facial ecchymosis—a review. Journal of dentistry, 41(11), 935-948. Zhang, K., Kim, Y. K., Cadenaro, M., Bryan, T. E., Sidow, S. J., Loushine, R. J., ... & Tay, F. R. (2010). Effects of different exposure times and concentrations of sodium hypochlorite/ethylenediaminetetraacetic acid on the structural integrity of mineralized dentin. Journal of endodontics, 36(1), 105-109. Bramante, C. M., Duque, J. A., Cavenago, B. C., Vivan, R. R., Bramante, A. S., de Andrade, F. B., & Duarte, M. A. H. (2015). Use of a 660-nm laser to aid in the healing of necrotic alveolar mucosa caused by extruded sodium hypochlorite: a case report. Journal of endodontics, 41(11), 1899-1902.